For the second day in a row, I drove out to Half Moon Bay to do some obscure peakbagging in San Mateo County. Unlike yesterday's longish outing, today's was a trio of much shorter ones. With heavy fog again, it was nearly as wet today as yesterday, the main difference being I didn't have to spend all day in sopping boots. Sandwiched between the Pacific Ocean and the airport at HMB, this squat ridge northwest of the harbor has it's southern tip ending at Pillar Point. Just offshore is the site of the famous Mavericks surf contest, held sometime in the winter months during years when conditions are right after a Pacific storm. Much of the land including the highpoint are preserved by the Pennisula Open Space Trust (POST) as the Pillar Point Bluff County Park. There are several parking lots providing access to the network of trails along the bluffs. I used the trailhead off Airport Rd, just north of a mobile home park on the east side. A trail climbs up the bluffs from that side, reaching the flattish highpoint in short order. I had no luck locating the benchmark which is either buried in the flora or no longer exists. It seems a small pool-sized section of earth was removed here by bulldozer long ago, leaving a small wetlands atop the ridge. 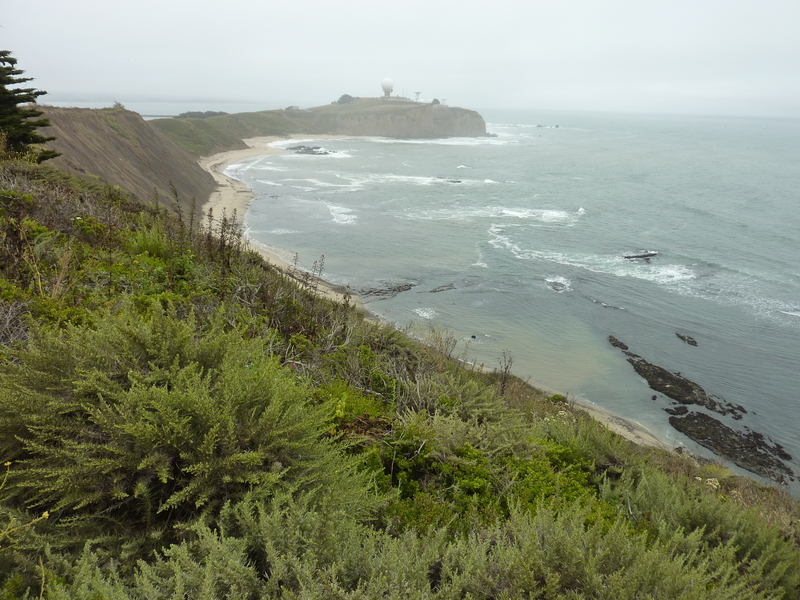 I followed the trails out to the bluff and then south about halfway to Pillar Point, home to a USAF installation. The bluffs are badly eroded with abundant signs to warn one away from the cliff edges where the trail is unstable. Of course I couldn't help walking up to the edge for a look in at least a few places. I imagine this place gets pretty crowded when the surf contest is in session. On a Sunday it was busy with a few dozen folks with dogs or family, a few on bikes. This point is found off Hwy 1, just across the highway from Frenchmans Creek Rd. Jim Retemeyer, who I suspect submitted this to PB, claims quite specifically that the highpoint is just inside the group camping gate, next to a wooden fence. I wandered around inside for a few minutes, but it would be impossible by any means to determine the highpoint. The ground is virtually flat and covered in waist-high vines, downfall, poison oak and other shrubbery that covers everything. By almost any definition, this is a very lame "summit". Just southeast of the town of Half Moon Bay rises this modest summit overlooking Hwy 1 and the Pacific Ocean. I used directions provided by Andrew Kirmse and David Sanger who had visited the place a year earlier. Their starting point at the historic Johnston House is a good one. The house and surrounding land is owned by POST. The home is open only one day a month, but parking is allowed during daylight hours other days. I thought it would be easy to find the use trail and didn't bother to download their GPX track. As it turns out, the trail is only distinct higher up and I ended up climbing 2/3 of the way to the summit before finding the good use trail. On the way back I followed the trail until it curved west towards a pair of small, picturesque ponds before mostly disappearing. This resulted in some minor traversing across the lower stretches to get me back to the parking lot. Interestingly, both up and down routes nearly recreated their GPX track. Marcus Sierra has a GPX track on PB as well and it would seem we all did pretty much the same thing. Just before reaching the highpoint, the trail cuts through a high brush barrier and dumps one on a dirt road on the other side. This is almost certainly private property, but there are no signs or fences. A short walk through tall grass on the other side of the road leads to the rounded highpoint. A deer I found here stared at me for some time without moving. As I'd already reached the highpoint and had no reason to scare it off, I retreated to leave it with the tactical highground. Views were marginal due to the fog but probably aren't that great with sunshine given the low stature of the summit and its rounded nature.